Does Your Clothing Fit Correctly? Nothing makes a person look worse than when their clothes don’t fit correctly. You may think an outfit’s snugness would be all you need to tell if your clothes fit incorrectly, but this isn’t always the case. What’s worse, is it can make you look unprofessional, sloppy and just plain bad, which can be devastating in the business world. If you don’t look the part, chances are that people will not hire you for a job or consider you for an open position. Here are a few universal guidelines to ensure that your clothes fit correctly and that you always look sharp and professional. You should be able to fit two fingers between your neck and your shirt collar. If it turns with you when you turn your head, your collar is too tight. If the shirt in question has sleeves, the seam connecting the sleeve to the rest of the shirt should lie precisely where your arm connects with your shoulder. Sleeves should come right to your wrist and just where your thumb bone meets your hand. There shouldn’t be any stray material hanging from your armpits when your arms are at your sides, and it also should not restrict your movements at all. The shirt should curve right along with your torso rather than hang off it or protrude forward from it. If you cannot still drive your car or give a handshake, your shirt is too tight. Determining if your pants fit correctly depends on their cut, but there are still a few universal rules. You should be able to put two fingers between you and your pants’ waistband. This way, if you eat a heavy meal or become bloated for whatever reason n, your pants still fit. If the front panel of your pants pucker or wrinkle when you put them on, the pants are too tight. No matter what you do, however, pockets will never look quite right due to their strange shape and structure. If the fabric doesn’t conform to your body shape when you sit down, that means your pants are too big. In the case of dress pants, the crease in each leg should run right down the middle of each pant leg, along the front and over each knee. 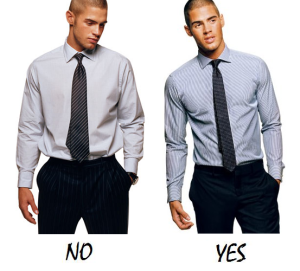 Just like with shirts, the seams at the shoulders should rest properly on the shoulders. This matters even more with dresses because the garment essentially hangs off of the shoulders when it fits correctly. If the dress properly fits your shoulders, then it should also have no problem fitting your hips. Be careful of dresses with empire waists because there is nothing a tailor can do if the waist is too high on your bust. This is also true of fitted waists since everyone is built differently. If you are unsure of where your waist is on you, stand up and bend sideways; where you bend is where your waist is.